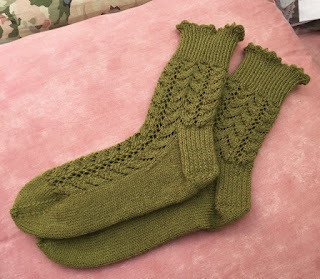 I finished another pair of socks. They are for a friend's birthday and I'm really pleased with them. The pattern is lovely and I particularly liked the zig-zag cast-on edge which I thought was unusual and pretty. It also means there is a lot of stretch at the top which makes them easy to put on and comfortable to wear. The pattern is "Herringbone Lace Socks" by Leslie Verts. It made me smile that I knitted these socks in green wool and the designer is called "Verts". My friend loves green! I had some leftover wool and have already started a second pair, from the toe up this time and two-at-a-time so I can use up all the leftover wool evenly between the two socks. Also because I found a picot cast-off method which I want to try next! 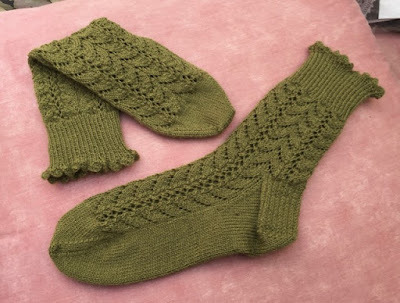 For the sock knitters out there: I don't know about you but I find that when I finish top-down socks with Kitchener stitches to close the toe, I always end up with the last couple of stitches too loose and I have to fiddle with them and sometimes tack them down with my needle so it looks tidy. I find that unsatisfactory. Knitting toe-up solves that problem for me as I find the toe really easy to make (using Judy's Magic Cast-on Method). have you tried one you like? I may change the pattern ever so slightly on this second pair and it will have to be two coloured as I will be using up other left-over wool to go with the green of which I won't have enough. 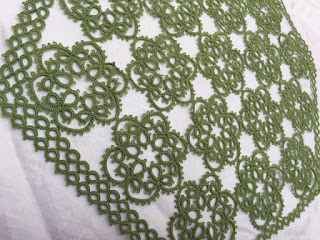 I'm making slow progress on the doily - more green! - because I'm spending too much time knitting at the minute. I'm more than half-way through the second round of split rings. There is third row of split rings coming next. So just more of the same! Ooh, those socks are very 'me', I love them! I hear what you say about Kitchener stitch, I usually tack down that last stitch as I sew in the end. With toe up I always worry about casting off in a way that is neat and stretchy, so I'll be interested to hear how you finish these off. I love the socks! I have the same problem with top down socks. I also find that I sometimes wind up with a toe that is way too pointy, which I find highly annoying. The last sock I started is way too big, so I'll be starting over soon. This time I'm going to try a toe up sock. I'll have to check out that picot cast-off! Preciosos calcetines y hermoso el tapete.Besos. I love them! Do the socks stay up well with this edge? I hate when my socks fall down. You make me want to knit socks again, one of my secret pleasures are hand knit socks and these are so pretty. That is a lot of split rings but it looks wonderful! As always, I am so impressed by your needlework skills and productivity. Your lucky friend will certainly enjoy these beautiful socks! I am intrigued to see this zig-zag cast-on edge, as it is a 'new' cast-on to me. A comfortable opening at the ribbing is important. Years ago I discovered the 'provisional cast-on with waste yarn', which meant I could do the ribbing later and could start the sock with the row AFTER the ribbing. After I finished knitting down to the toe, I picked up the 'live' stitches from the provisional cast on, and knit the ribbing upward, allowing me to bind off the ribbing loosely. And I could make the ribbing higher if I wished. 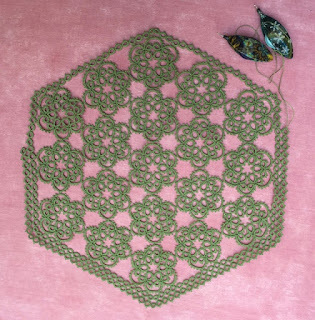 Below is the link to a video of the provisional cast-on using a crochet hook - I just discovered it has been around since 2011! I always wondered why the knitting books never mentioned doing it with a crochet hook; but then again there was always this situation where knitters feared learning how to crochet, and crocheters feared learning how to knit. Happily for me, it was easy to learn both! Hi Kathy, yes, this is knitted off a crochet chain but the chain remains there, you do not remove it afterwards. This lets you knit forward and backwards in a few of the stitches to create the zig-zag shape. What you say about a provisional cast on and making the ribbing afterwards... makes me think you'd like toe-up socks! Have you tried them?